Whether you're on business, holiday or just learning French at your own pace, this Collins French to English and English to French Pocket Dictionary is designed to give you all the information you need in a handy, compact format. A modern French dictionary offering excellent coverage of today's French language, culture and usage, this dictionary has the most up-to-date words in both languages from a wide range of areas. An in-depth `French in Focus' supplement contains information about French language and culture to enhance your learning, plus full GCSE coverage so students can use this French dictionary for GCSE exam success. A `French verb tables' supplement features the most common irregular verbs and examples of verbs in use to help improve your fluency in different situations, such as sending an email or making a phone call. 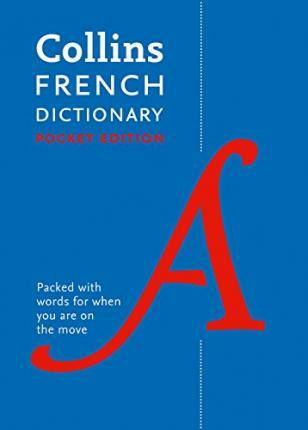 This pocket French dictionary includes 40,000 words and phrases, 60,000 translations and all the features you would expect from a Collins dictionary: an easy-to-read layout, special treatments of key words, notes about life in French-speaking countries and warnings on common errors and faux amis. For more on French language usage, the French Essential Dictionary (9780008270728) is also available.